Getting very close to launch!! 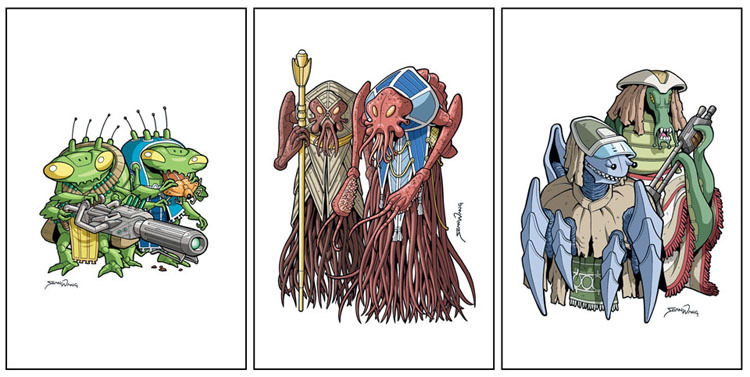 Here are some samples of more rewards: 4×6″ character cards. There will be 8 different cards, each featuring a duo of Snow Job characters. The lower reward tiers will come with one random card (which makes for a nice bookmark), but all mid-level and higher tiers will come with a complete set of 8. It’s been a lot of fun drawing these characters again, especially the Preegans (left) and Dhama Hes (middle), who only appeared in the first chapter of the story. So it’s been a long while since I’ve had the chance to draw them! It’s like revisiting old friends. Old weird, tentacle-y friends.